Humans and wildlife are exposed to an infinite number of different combinations of chemicals, via food, consumer products and the environment. 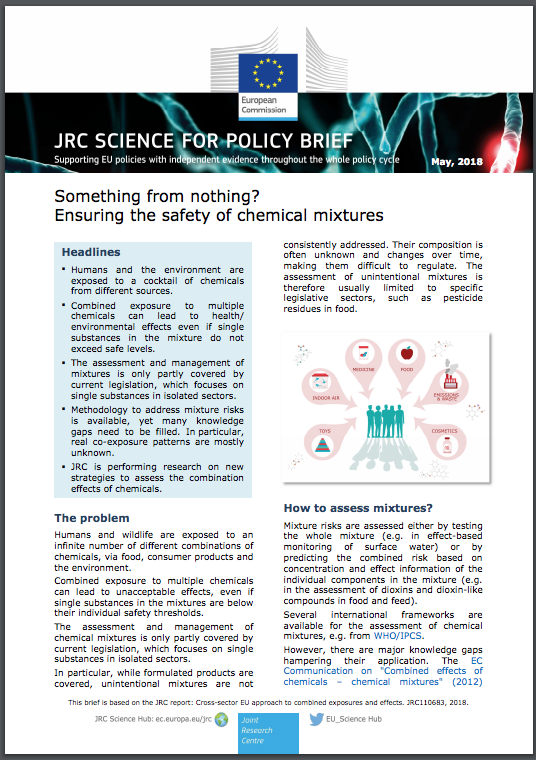 Combined exposure to multiple chemicals can lead to unacceptable effects, even if single substances in the mixtures are below their individual safety thresholds. The assessment and management of chemical mixtures is only partly covered by current legislation, which focuses on single substances in isolated sectors. In particular, while formulated products are covered, unintentional mixtures are not consistently addressed. Their composition is often unknown and changes over time, making them difficult to regulate. The assessment of unintentional mixtures is therefore usually limited to specific legislative sectors, such as pesticide residues in food.